Moving not only means deciding what you are going to take with you, it also means deciding what you are not going to take with you. Purging before a move is just as important as packing the things that are coming along for the journey, and if you don’t incorporate decluttering and purging strategies into your move, you might find you end up in a new space with not enough room for everything, especially if you are downsizing. 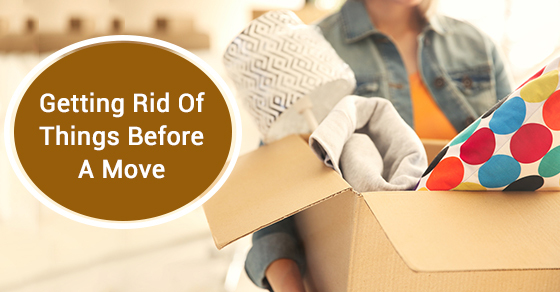 If you are in the process of planning a move, below are some tips for helping you purge. If you can’t remember the last time you bought new towels and linens (it might even be the last time you moved), you might want to consider giving away or donating what you currently have. If you are unsure about what exactly you want to keep, and what you want to toss, self storage units are a great way to keep things out of the way until you decide. It is always a good idea to periodically go through your closet and figure out what you actually wear on a regular basis and what items are simply taking up space. You can always donate clothes to places like the Salvation Army or homeless shelters, where they will be put to good use, and you can feel good about not just throwing things into the garbage. Most people end up accumulating a wide range of cosmetics and toiletries over the years that they try out for a week or so, end up not liking, and simply stash under the sink to sit in limbo. When packing up your bathroom before your move, don’t pack all those old cosmetics and toiletries. They take up a lot of space, after all. We all accumulate a lot of paperwork over the years. Some of it is necessary and vital, some of it is just sitting there collecting dust and can be recycled. If you are unsure whether or not something is vital, and you don’t have the time to do a thorough analysis of everything you have, a self storage unit where you can dump boxes of documents while you move will potentially save you a lot of hassle. Moving and getting rid of things at the same time can be stressful, which is why it pays to invest in a self storage unit that will allow you to postpone having to take a good, hard look at everything while you are trying to move your life from point A to point B. Consider the above purge tips next time you move and help make the process as seamless as possible.